Handlebar Mounted Weight DisplayThe display on the CPWPlus 35W is mounted on the transportation frame right under the handlebars. The display is in the perfect position, right out of the way of big boxes and other things you might weigh. Rechargeable Battery PackYou won't have to worry about searching high and low for a wall outlet to plug this bench scale into. The CPW-35W scales have an internal rechargeable battery with up to 60 hours of battery life on a single charge! RS-232 Serial PortThe CPWplus-35W has an RS232 port built right in. This is important if you want to send your weight readings and other data to an external source like a computer or printer. Adjustable FeetThis very handy feature will help ya quickly and easily get your CPW 35W nice and level. 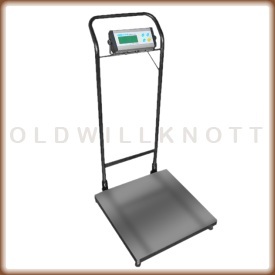 A level scale is important for getting the most accurate weight readings. All ya have to do is twist the feet on the bottom of the scale until scale is level. Easy To Clean, Sealed KeypadYou won't have to worry about dust and dirt getting stuck under and around the buttons on this weight indicator...The CPW-35W had an easy to clean membrane keypad with accurately labeled keys for easy weighing. Programmable Backlit DisplayThe CPWplus 35W has a backlit weight display ya can program to always stay on, turn on with the press of a button or weight change, or to stay off. This feature is great for saving battery power. I received my scale in a timely manner. It was exactly what I ordered. Thanks! Great Scales !!!!!! Great Service !!!!!!! and a Happy Customer. Adam CPWplus 35W Can I get this scale with at least a 150 pound capasity? Adam has several models available in the CPWplus series. 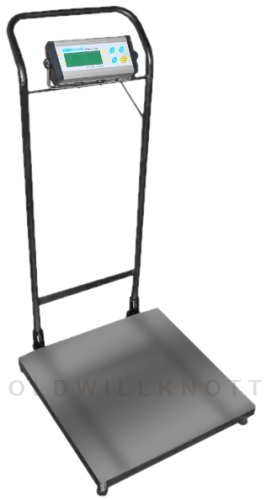 The higher-capacity equivalents for the CPWplus 35W (75 lb capacity) would be the CPWplus 75W (165 lbs), the 150W (330 lbs), and the 200W (440 lbs).